What Does Fear Really Prevent? We seem to think that our fear is protecting us from something? We often come to the conclusion that if we’re afraid, it means that we shouldn’t do it. Don’t do it, you could go broke! Don’t do it, you could embarrass yourself! Don’t do it, you could get hurt! Don’t do it, it’s not the right time! Don’t do it, you’re not sure why, but you feel scared and that’s reason enough! So does your fear prevent bad things from happening? Or does it prevent something else? Does it prevent you from taking the necessary risks required to live your best life? Does it prevent you from separating yourself from the herd? 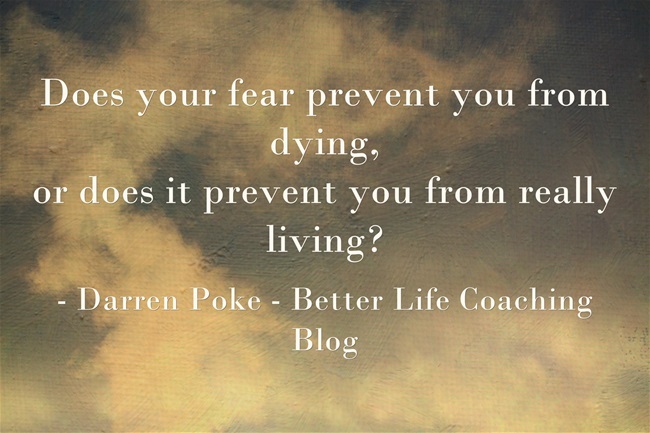 Does your fear prevent you from dying, or does it prevent you from really living?